Tomorrow is the first day of October and the start of Domestic Violence Awareness Month (DVAM). 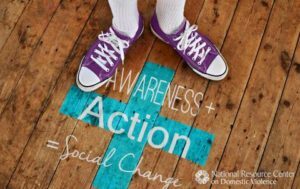 This is a time for people across the country to raise awareness about dom estic violence while also taking action to prevent domestic violence from happening in the first place. We know awareness alone will not create the deep social change needed to create healthy families and communities, but when action is added a greater impact can be made. Preventing domestic violence is possible when we take intentional action to collaborate across social justice movements. Domestic violence intersects with all forms of oppression and our efforts to prevent domestic violence must reflect that. The 2016 season of PreventConnect web conferences was dedicated to the need to collaborate with other movements to create community and society level change and DVAM is an opportunity to further these discussions.